Arethusa was sold in 1943 & the Winsome acquired. She is described as a 34′ flush-decked launch built by Bailey & Lowe (that will please HDK) in 1918 with a draft of 2′ 7″ & had previously been owned by Hereward’s father since 1923.
photos – the 2 colour photos of Arethusa and Winsome together were taken by Dean earlier this year in the Bay. 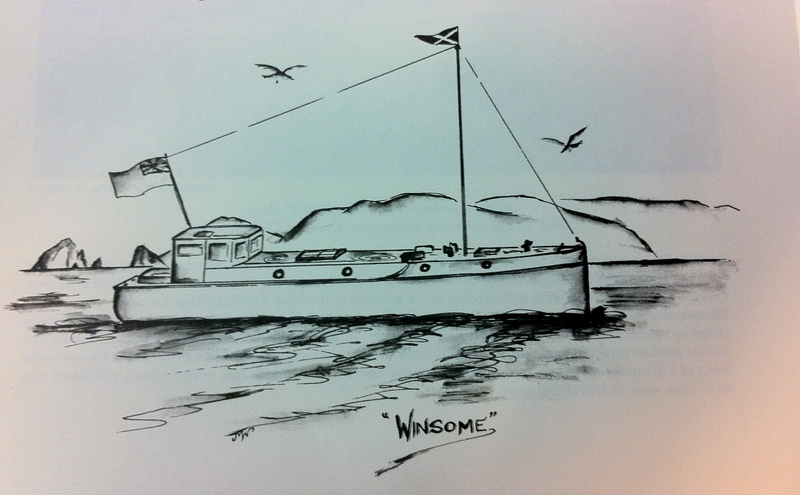 The b/w sketch below of Winsome is ‘borrowed’ from Pickmere’s Atlas of the Northland coast. Update 25-07-2018 ex Arethusa owner, Dean Wright. The cutting below show Arethusa leaving Auckland on-route to Suva. This entry was posted in 1910's, Launches, Non Waitemata, Yachts and tagged Arethusa, Bailey & Lowe, Bob Brown, Winsome by Alan Houghton - waitematawoodys.com founder. Bookmark the permalink. Russell how’s that temporary tiller going? Yr folwing te blog but o yr emails. A Roger Carey design, ’nuff said. John Gander built Hinewai if I recall correctly a fine ship seen out and about on the Mahurangi. Another of my dreamboats…..
Well done! Plenty of smiles all round. Considerable improvement to the engine space and a much better shipmate than the old engine. Arethusa presently has a 135 hp Ford Diesel, but will shortly have a 4LW Gardner, which is being made ready to replace it. Haven’t got immediate access to my ’55 “Sea Sprays”, but I think “Arethusa” was wrecked at the entrance to Whanganui Harbour, at the northern end of the West Coast, rather than Farewell Spit itself. I question your statement that “Pick” was employed by the Lands & Survey Dept to map the Northland coast. I think it was a labour of love.